Can immigration and drug problems be solved? Nearly 20 million people of Mexican descent live in the United States — including several million working here illegally. Mexico's charismatic new leader, Vicente Fox, seeks amnesty for at least some undocumented Mexicans, an arrangement President Bush appears willing to consider. American labor unions and immigrant-rights advocates say Mexican workers in the U.S. provide invaluable labor and deserve to do so without living in fear of deportation. Critics say amnesty rewards lawbreakers. 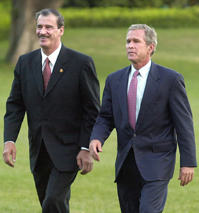 The strong working relationship between Bush and Fox may help the two countries resolve several other thorny issues, including American “certification” of Mexico's efforts to stop drugs from entering the U.S. and the impact of the North American Free Trade Agreement (NAFTA) on Mexico's developing economy.